Christmas is just around the corner, but there is still time for business owners to leverage the season when it comes to sales. This Christmas, Sparx IT Solutions brings special offer for the business owners by unveiling the astonishing discount offers and deals for them. When you consider that online sales were expected to grow by more than 15% this time of the year, there has never been a better time to sell via the Internet. Customers who are juggling with their hectic work schedules and holiday events, appreciate the convenience of online ordering. Considering this for the first time, we have introduced FLAT 10% OFF on digital marketing where business owners can gain ranking to their online store and increase their visibility/ popularity/ ranking and in proportion experience a good ROI. The bucks do not stop here ! You can build a beautiful holiday greeting around a compelling promo or special offer that your customers will not want to miss. 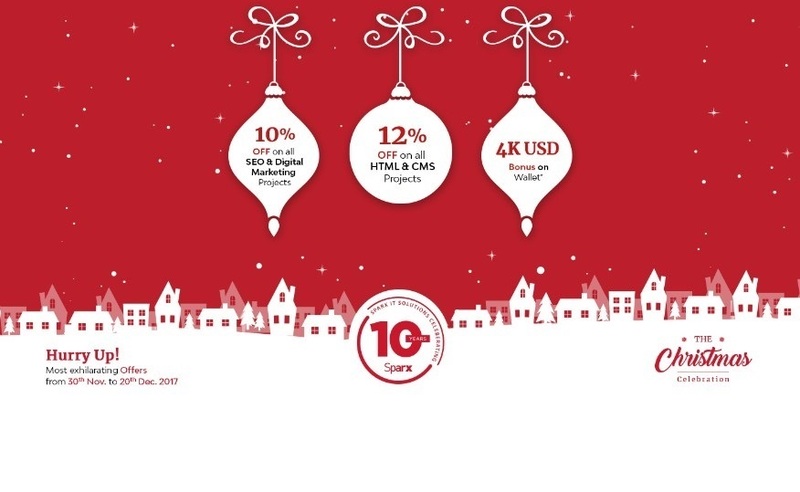 To make Christmas unforgettable this year, we announce FLAT 12% OFF on all Email Newsletter. The curtain of our other offers for web development is up too, so don’t get late as the Santa is waiting with Gifts wrapped with alluring discounts!